Just like my home girl Lady Gaga’s single, Judas, EUR/USD dropped on the charts (by more than 500 pips!) when ECB President Trichet left out the words “strong vigilance” in his statement and stopped me out at 1.4770. I guess I was too late in befriending the trend. I bought the pair at market (1.4845) ahead of the ECB interest rate decision. Yep! I guess you could say that it was very impulsive of me for doing so. I hadn’t anticipated much changes from the ECB’s rhetoric so I thought that there was more room for the pair to move up than down. But boy was I wrong! Oh well! What’s done is done. I don’t want to be such a cry baby anymore. But rest assured that the lesson is learned: be patient. Heck! How can I not be careful with that 1.0% loss on my account? I think playing the break out would have been a better and safer idea. What do you think? Anyone of you guys made dough on EUR/USD? Tell us how by writing on the comment box below or hit me up on Facebook or Twitter! As you can see, the pair broke above the range yesterday and made a new high. With the appearance of the bullish divergence and with the pair having found support at the week open, I’m anticipating a repeat of yesterday’s price action. My crystal ball* seems to show that EUR/USD has the potential to break out of its trading range and trade past yesterday’s high. In order to catch the move, I decided to open two positions. 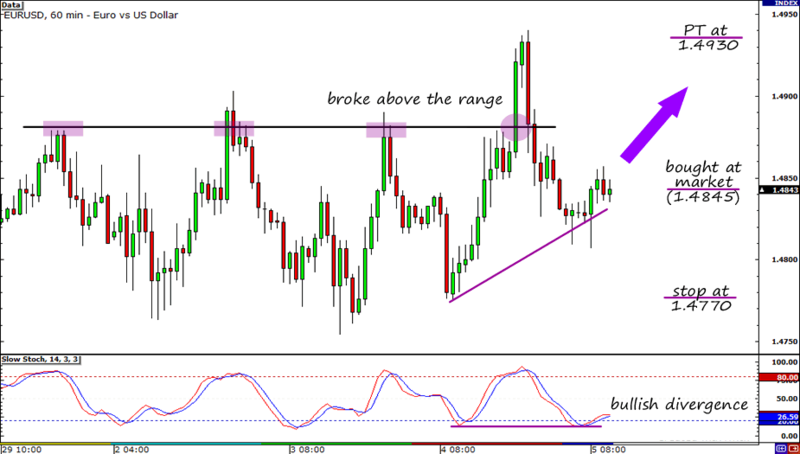 The first position aims to take profit just a few pips below yesterday’s high at 1.4930. For the second position, I’ll just let it ride and close it manually at the end of the week. Of course, as always, I’ll be using a stop loss. I placed my stop below yesterday’s low at 1.4770. If price reaches this level, I believe that my trade is invalidated. I’m all about having fun, but I don’t want to be in the market when the NFP report sparks fireworks on the charts. I may even close it early when prior the NFP! I’m also wary about the upcoming European Central Bank interest rate decision at 7:45 am EST. It won’t be as big as the NFP, but it has the potential to cause some strong breakouts if the ECB does not keep rates unchanged at 1.25% as the market expects it to do. Still, I personally think that the bias is to the upside due to the rising food and commodity prices. Buy two positions at market (1.4845), first pt 1.4930, second pt yet to be determined, stop loss at 1.4770. I feel good about this trade. How about you? Follow me Twitter, like my page on Facebook, or leave your sweet nothings in the comment box below.